The Pakistani and Afghan PAJC delegations met with Afghanistan CEO , Dr. Abdullah Abdullah at his office to discuss important issues. The meeting, lasting over 90 minutes, consisted of frank, robust and candid discussions. 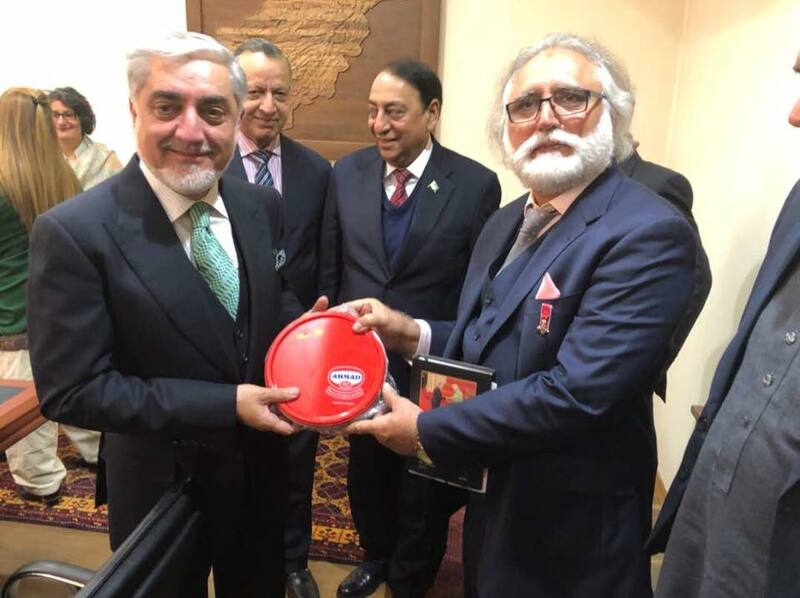 The Pakistani delegates of the track 1.5/II project Beyond Boundaries were grateful to Dr. Abdullah for his continuous support to the initiative and providing opportunities to meet with them frequently as this was the fourth meeting of Beyond Boundaries delegations with the CEO since October 2015 when the project started; earlier meetings were held on 03 December, 2015; 22 December, 2015; and 16 November, 2016. Pakistan delegation recalled with grief that 16 December marks the third year of the tragic attack at the Army Public School (APS) in Peshawar by terrorists killing hundreds of young innocent children. Everyone present at the meeting commemorated the sad occasion by observing a one-minute silence and offered prayers for the young children martyred and their aggrieved families. 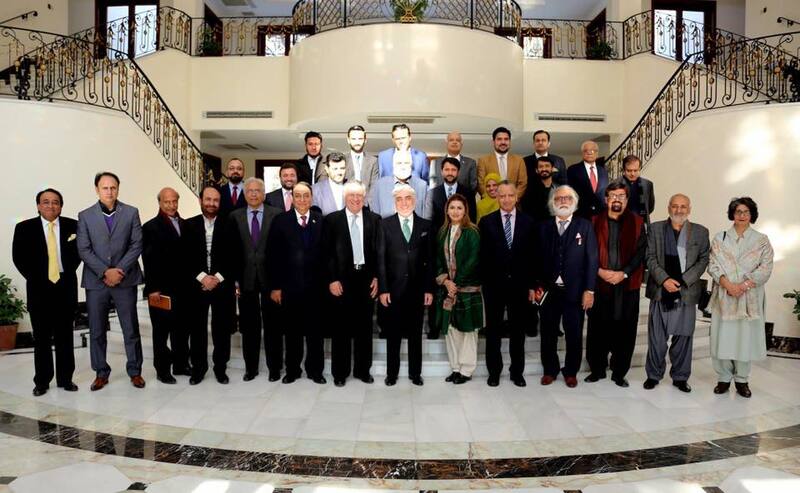 Dr. Abdullah welcomed the Beyond Boundaries delegates by saying: “I warmly welcome the CRSS and OESP and the distinguished Pakistani group comprising parliamentarians, civil society members and senior media persons. This is a very diverse group, we need to strengthen it, improve it and take it further to more people-to-people level. I do support your track II system and will continue to do so. Sometimes gravity of politics affects people-to-people contacts, but efforts like yours should continue. You have come here at a time, when we are in general looking at better relations. After your Chief of Army Staff (COAS) Gen. Qamar Javed Bajwa’s visit in October, we received excellent proposals from the Pakistan side. We have mutually started a process of working groups including trade and economics. We look forward to working together with Pakistan and improving bilateral relationship. Let me request you to share your views in a very frank and candid manner, and I will respond to your questions as candidly”. 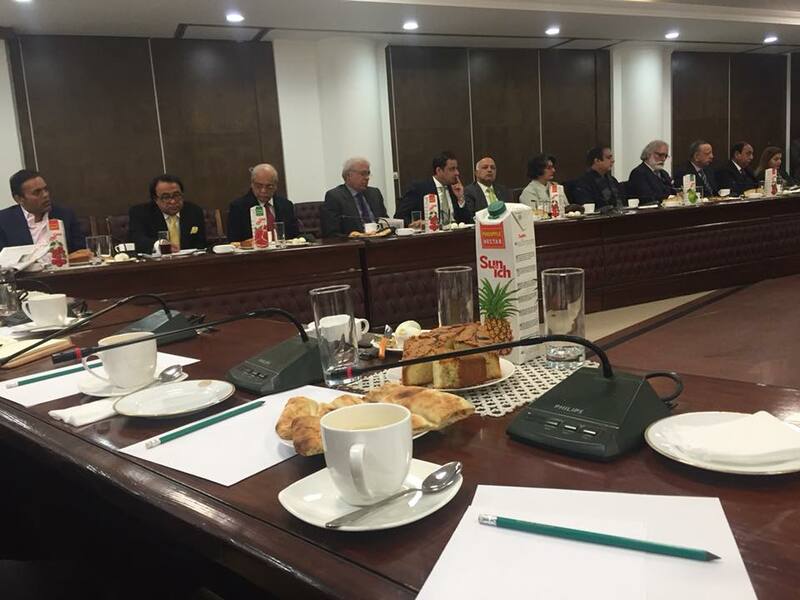 Head of Pakistani delegation, MNA Rana Afzal Khan spoke first from the Pakistan side, saying: “Thank you for welcoming us, we are very pleased to meet you, we have a number of parliamentarians with us as well as retired military and civil senior officers and senior media persons. We have had very useful and detailed discussion among the two groups with the emphasis on trade and commerce among other important issues. We have come up with a joint declaration of policy recommendations, which we will share with you”. As the Finance parliamentary secretary, I can assure you that on the trade side we are very seriously working on the resumption of the Afghan Pakistan Transit Trade Coordination Authority (APTTCA) meeting. As you mentioned we have made good progress after the COAS visit, as five working groups are jointly working now. We have 3000 scholarships for Afghan students, especially including 100 for women. One of Pakistan’s most prestigious institute LUMS has also announced 100 scholarships as well. On the visa regime issue, we were informed by our embassy here that 1600 visas are issued to Afghans daily from Kabul and another 1600 from other consulates. There are still some issues due to which Afghans face hardships, we are trying our best to improve upon these procedural issues. Mr. Qureshi concluded that similar efforts should be made by the government of Afghanistan and help from the group is extended to support any efforts. MNA Ms. Shazia Marri said that deficit of trust exists between our two countries. We need to work on this deficit of trust and work together and jointly to improve our bilateral relationship. Being a women parliamentarian, I would like to say that there is a need for the women of both countries to work together closely – women parliamentarians, women journalists, women civil society members and leaders – we need your help to introduce such initiatives. Former ambassador Ms. Seema baloch remarked that security and political issues should not hamper trade relations, we should move forward to improve bilateral and transit trade; which in turn will improve bilateral relations. Senator Murtaza Wahab while also thanking the CEO said that we should build on commonalities. We need to focus on common grounds particularly trade, education, civil society etc. Senior journalist Kashif Abbasi told Dr. Abdullah that he had started his journalism career as an international affairs reporter, and one of his earliest memories is meeting him in 2002. He further said that Pak- Afghan relations have soured over time: “I would agree with Murtaza that we need to focus on common grounds; may be small steps, small measures. We as media practitioners can also play a role in creating this kind of mechanism”. Senior journalist Zahid Hussain gave reference to recently visited university and interaction with youth, where misperceptions resulted in hostile questions. He said that we need to build and start working on removing misperceptions and address the distrust. Lt. Gen. (retd) Asif Yasin while appreciating the articulate and impressive past of the CEO remarked: “you are a mover & shaker, go-getter. We have lots of hopes from your office to get things moving. We would expect your indulgence in our policy recommendations, and generally in improving relations with Pakistan. You should indulge at the highest level”. 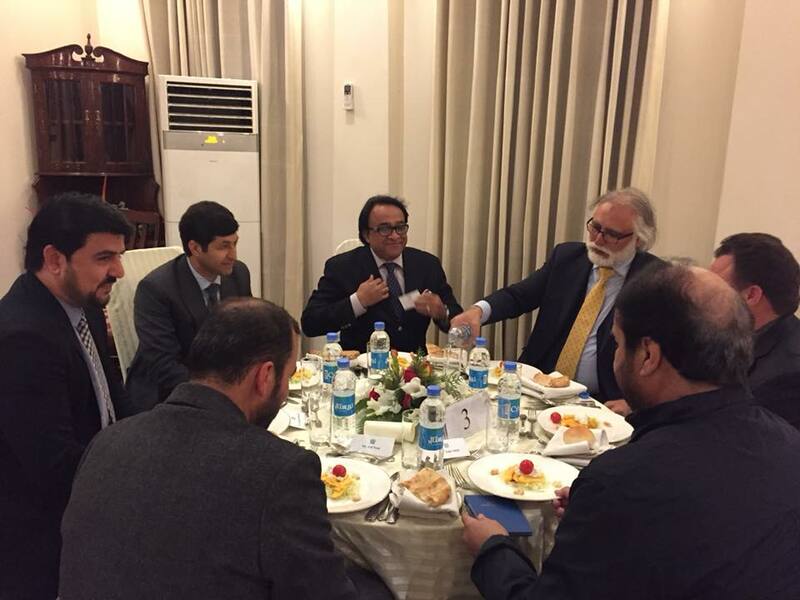 Former Ambassador Qazi Humayyun paid compliments to the CEO and said you are the most experienced person to be dealing with us – with your previous assignments and positions – you are best placed to move Pak-Afghan relations forward. I would like to request you that your much anticipated visit to Pakistan is still awaited. We would once again like to request you to visit Pakistan. On a lighter note you need to find a balance between your visits to India and Pakistan. Senator Shibli Faraz said that we are fighting against common threat which is terrorism. Unfortunately we have been involved in a war which was never ours; we were forced by other countries to engage in this war. The most important causality has been the economic development, we need to address this, and for the benefit of the people of both countries it is imperative that we concentrate on economic development. We need to concentrate on education as well for the betterment of youth of both countries. We need to engage in common way forward. Your peace is our peace; your destiny is our destiny. We need to move forward and improve relations. Dr. Shoaib Suddle, former IG Police and federal tax Ombudsman, who has been part of Beyond Boundaries since the track II initiative started, gave reference to the last meeting with the CEO and said: “in our last meeting with you November last year you gave us a breaking news that you will be visiting Pakistan; we are still awaiting to welcome you in Pakistan”. He noted that we have had a bad 2016, while 2017 was better; we expect and hope 2018 to be even better in moving forward towards betterment of relationship. He said that the APTTCA meeting has not taken place so far, and the delay has been on the Afghan side, we would like to request you to convene this APTTCA, so that the mechanism on transit trade can be reviewed and move forward. We would also like to request both governments to ease visa regime on both sides for the benefit of people of the two neighboring countries. He told the CEO that it has been brought to the knowledge of the group by Pakistan embassy that last time the promise made by the CEO to “waive off duties and tariffs” on the import of medical equipment for Pakistan development project Jinnah Hospital, is again faced with some delays on minor procedural invoices issue, we would be grateful if you can look into this and resolve it. He also shared that the issue of medical staff that is trained at the Jinnah Hospital and then they are transferred elsewhere after completion of their training, if this can be looked at and resolved, as this stops the process and the training of staff has to be started afresh. Ms. Faiza, Secretary General PAJJCI apprised the CEO that the missing link is between the official and private sectors of both countries. PAJCCI works together, as the Afghan PAJJCI President is ambassador for Pakistan, and the Pakistan Chairman is an ambassador for Afghanistan. Media in Afghanistan needs to focus on connectivity. Afghan media is generally negative towards Pakistan. Such meetings like ours with you today should be highlighted in media and disseminated to public. Dr. Abdullah thanked the Pakistani delegation for sharing their frank and candid points of view. He told the delegation that the 16 December APS terrorist attack was a tragic day for us as well, because we can feel the pain of the aggrieved families. It makes it incumbent upon us to work together for Counter Terrorism. Security is a common concern for all of us. While, we are having opportunities to connect, we also need to tackle terrorism jointly. On the reference to the waiver of duties and tariffs on import of medical equipment, he remarked: “I thought it was resolved. It looks silly even if there are no invoices the equipment should still come”. I would look into it again and promise to resolve it. He instructed his Advisor Mozammil Shinwari to work with Pak embassy and the relevant ministries and authorities for earliest resolution. He asked Advisor Shinwari to brief him on APTTCA status. Mr. Shinwari told the CEO after last meeting of APTTCA was held in Pakistan, it is now Afghanistan’s turn to hold the meeting, and unfortunately it is almost a year and half that it has not taken place. He further briefed that the Pakistan side has sent its proposal for more than a year now, but nothing has moved from our side. The CEO then remarked again: “I assure you we will work it out and resolve it ASAP”. Dr. Abdullah replying to MNA Shazia Marri’s remarks, said: “I agree with women forums such as women parliamentarians’ cooperation and also in other fields”. He added that that visas should not be a problem: “The kind of good work that you are doing as a group and as track II project; we need to remove those”. He agreed that economic development and cooperation is very important: “trade issues altogether need to be addressed at top priority”, he said. He further stated: “I agree with you we don’t need to stop at security alone, we need to move on other issues such as trade, and education. We are grateful to Pakistan government for the scholarships, even to LUMS for their scholarships. Education of our youth is very important to us”. In his concluding remarks he said that the main thing here is that the security issue vis-à-vis the Taliban is not an issue of mechanism. But, there is an impression that dealing with the Taliban, the political will to deal with this issue is not there. “I thank you all for your efforts, we will start a mechanism of follow-up here. And I promise you that the long standing issue of my visit to Pakistan will also be resolved”. Senator Shibli faraz, who is also the Chairman Senate Standing Committee of Commerce, presented and shared the joint declaration of policy proposals with the Afghan CEO. 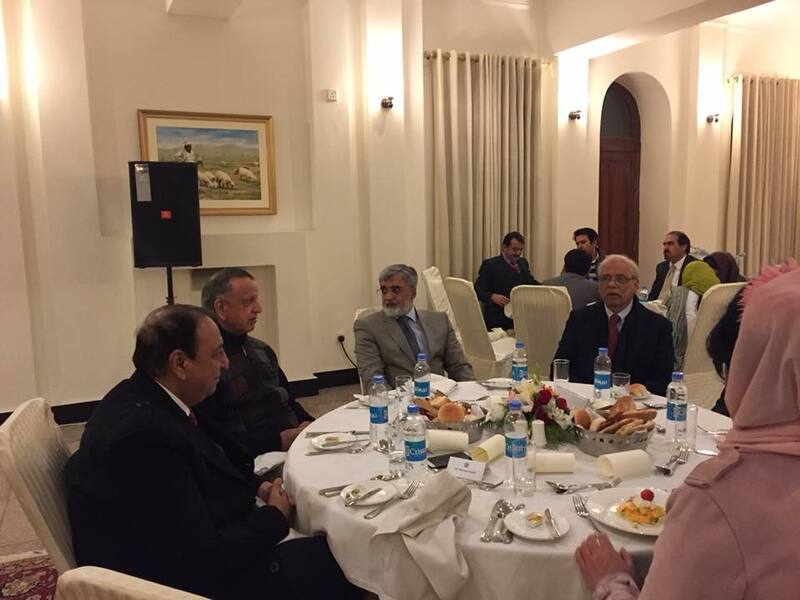 After the meeting Dr. Abdullah Abdullah hosted both Pakistani and Afghan delegations for a working lunch.